Definition of Trance State: What is Trance State? A Trance State is associated with meditation, magic, hypnosis and prayer and is also related to altered states of consciousness. The term 'trance' is derived from the Latin word transire meaning "to cross over". A trance state produces an out-of-body experience in which a person feels they have passed out of the body into another state of being. A Trance state may be accessed, or induced, by various means and is a way of altering the state of consciousness by accessing the unconscious mind for the purposes of Spiritual Healing, intuition and inspiration. 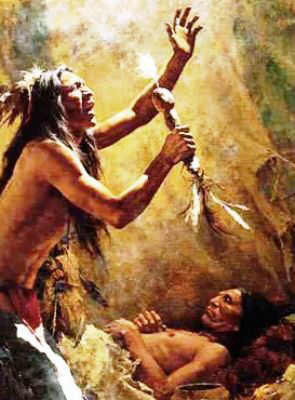 Native American Shamanic healers have utilized methods to produce altered states of consciousness in themselves and their patients for thousands of years. A wide variety of plants are used by Medicine Men to alter consciousness and enter the trance state. Natural Herbal Herbs strongly feature in the ceremonies and rituals of Native Americans and used for their hallucinogenic and narcotic properties to alter consciousness, induce Trance States, spiritual experiences and Spiritual Journeys for rites of passage rituals, such as Vision Quests. The herbs and plants used to induce the trance state included Mescal, peyote cactus, thorn apple, psilocybin mushroom, green tobacco, jimsonweed and devil's weed. A Vision Quest or Spiritual journey was undertaken or directed by a Medicine Man or Shaman and was sometimes accompanied by the inducement of a trance state. The purpose of this type of undertaking was to attain guidance or knowledge from supernatural forces or spirits to assist when the tribe is facing adversity or need to obtain solutions to problems afflicting the community including sickness. The trance state allows the Shaman to project his spirit out of his physical body while he is still awake. This trance state might be accompanied by a strong numbing sensation or experiencing the sensation of being in two places at once or might also be described as a highly focussed day dream. The role of the Native American Shaman, or Medicine Man, is that of opponent to the bad spirits and of guardian to the ordinary man. 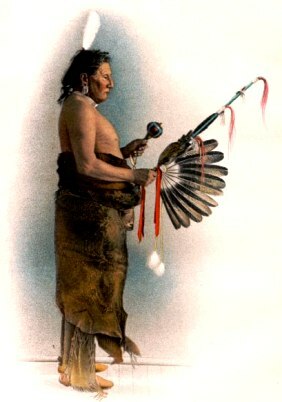 The belief and practises of Native American Indians incorporate a number of beliefs such as Animism, Totemism, Shamanism, Fetishism and Ritualism. The role of the Shaman, or Medicine Man required the ability to enter a Trance State to help him to acquire the required skills as a healer, educator, prophet and mystic. He possessed supernatural healing powers and the ability to treat sickness caused by evil spirits - hence the Westernised name 'Medicine Man'. He had the ability to perform various forms of prophecy. And the Shaman or Medicine Man was a mystic possessing the ability to leave the body and communicate with the spirit world. The Shaman acquired many of these abilities by entering the Trance State. The Trance State is sometimes referred to as a Hypnagogic State or the process of Hypnagogia meaning the transitional state between wakefulness and sleep. The term Hypnagogia is derived from the Greek words "hypnos" meaning sleep" and "agogos" meaning leading or inducing. During this condition, the Trance State, the mind functions in an altered state of consciousness or awareness that is somewhere between consciousness and unconsciousness. During the Trance State the focus of attention is narrowed and the inner consciousness is accessed enabling the Shaman to become 'open' to suggestion from within or without. There were various rituals undertaken by a Shaman that required him to enter a Trance State enabling him to gain entry to the Spirit World. Power Animals, or the less powerful plant Spirit Helpers, might present themselves to the Shaman or members of the tribe who were in the Trance State. The main rituals that required a heightened Trance State were those relating to rites of passage in which a young man proved himself to be a man. Altered states were also produced in the Salish Spirit Dance and the Sun Dance ritual practised by the Native American Indian tribes of the Great Plains. Trance State. Discover the vast selection of pictures which relate to the History and Culture of Native Americans. The pictures show the clothing, War Paint, weapons and decorations of various Native Indian tribes that can be used as a really useful educational history resource for kids and children of all ages. We have included pictures and videos to accompany the main topic of this section - Trance State. The videos enable fast access to the images, paintings and pictures together with information and many historical facts. All of the articles and pages can be accessed via the Native Indian Tribes Index - a great educational resource for kids.